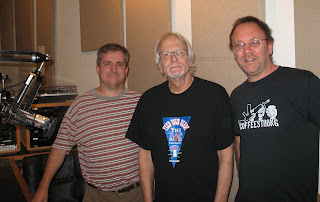 Singer/songwriter David Rovics on Rag Radio, Friday, June 1, 2012. Video produced and edited by Jeff Zavala and filmed by Grace Alfar of ZGraphix at the KOOP studios in Austin. David Rovics, noted American indie singer/songwriter and activist for peace and social justice, was our guest on Rag Radio, Friday, June 1, 2012, first broadcast on KOOP-FM, Austin's cooperatively-run all-volunteer community radio station, and streamed live to a worldwide Internet audience. The show included live performance. David Rovics lives in Portland, Oregon, and tours regularly on four continents, performing at cafes, pubs, universities, churches, union halls, and protest rallies. His music has been featured on Democracy Now!, BBC, Al-Jazeera, and other major media outlets. His essays have been published on CounterPunch and Truthout, and the 200-plus songs he makes available for free on the web have been downloaded more than a million times. Rovics grew up in a family of classical musicians in Wilton, Connecticut. By the early 90's he was a full-time "busker," performing in the Boston subways, and by the mid-90's he was traveling the world as a "professional flat-picking rabble-rouser." Amy Goodman called David Rovics "the musical version of Democracy Now!" And Andy Kershaw of the BBC said, "If the great Phil Ochs were to rise from the dead today, he would probably be hailed as the new Daivd Rovics." On Rag Radio, Rovics discussed his career and his commitment to social activism, and the relationship between his politics and his art. Rovics, who became involved in the anti-nuclear movement when he was 12, says of his work: "I'm doing what songwriters have been doing for millenia -- which is writing songs about what's happening in the world." And we talked about Rovics' recent trip to Europe where he toured from Scotland and Ireland to Germany and Scandanavia, playing before crowds ranging from the single digits to the hundreds, in venues with names like the Wee Folk Club and Filthy McNasty's, in school classrooms and at mass political rallies -- including the May Day festivities in Denmark. In Belfast, he performed in an occupied bank building with legendary Irish singer and activist Tommy Sands, and he did a show with squatters in a dilapidated old building in Amsterdam. And he played at a protest against a coal mine in rural Cologne, where his contact, he laughs, was "a young man on a bicycle wearing a pink skirt." Rovics, who played at more than 30 Occupy Wall Street camps around the country, says he thinks the Occupy Movement "changed the whole scope of the discussion in the mainstream media" about power and wealth in the country. About the political scene today, Rovics, who calls himself a "libertarian socialist," told the Rag Radio audience that "both political parties are almost entirely bought and sold by the banks and oil companies. And the banks and oil companies are duking it out to figure out who can dominate the world." He says we face a choice "between a corrupt Democratic Party and an absolutely lunatic -- and corrupt -- Republican Party." Rovics calls our current options "dismal," and says that our only real solution is to build a mass movement for social change outside the political system. Find out more about David Rovics -- and download free music -- at DavidRovics.com. From left, Rag Radio's Tracey Schulz and Thorne Dreyer with singer/songwriter David Rovics in the studios of KOOP-FM in Austin, Friday, June 1, 2012. Photo by James Retherford / The Rag Blog. 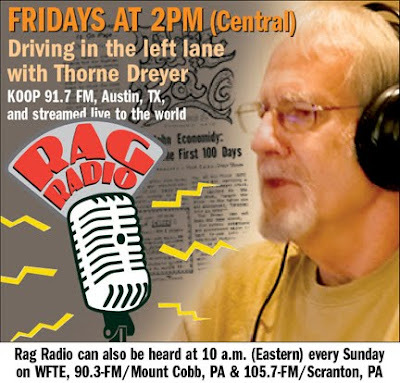 Hosted and produced by Rag Blog editor and long-time alternative journalist Thorne Dreyer, a pioneer of the Sixties underground press movement, Rag Radio is broadcast every Friday from 2-3 p.m. (CST) on KOOP and streamed live on the web. Rag Radio is also rebroadcast on Sundays at 10 a.m. (EST) on WFTE, 90.3-FM in Mt. Cobb, PA, and 105.7-FM in Scranton, PA. After broadcast, all Rag Radio shows are posted as podcasts at the Internet Archive. THIS FRIDAY, June 8, 2012: Author and crusading journalist Ronnie Dugger, Founding Editor of The Texas Observer. June 15, 2012: American Botanical Council Director Mark Blumenthal on Herbal and Alternative Medicine. June 22, 2012: Gay Marriage in America with Gail Leondar-Wright and Betsy Leondar-Wright.